Daytona Beach, Florida. Porsche Motorsport will continue to celebrate its longstanding motorsport history with a fourth “retro-livery” adorning the pair of current factory-run 911 RSR race cars. This morning, in a surprise announcement at the team’s garages, the Porsche GT Team unveiled the livery created to commemorate both Brumos Racing and IMSA’s 50th Anniversary season at the Rolex 24 At Daytona on January 26 – 27. The Nos. 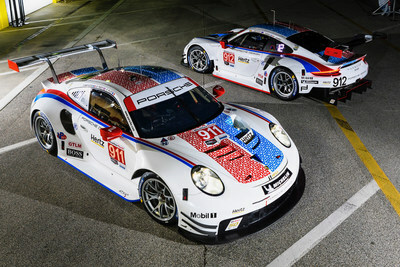 911 and 912 will carry the blue and red stripes and “sweeps” made famous by the Jacksonville, Florida-based team in the first two rounds of the IMSA WeatherTech SportsCar Championship including here this weekend at Daytona International Speedway as well as in the 67th edition of the Mobil 1 Twelve Hours of Sebring on March 16. The livery, designed in-house at Porsche, pulls directly from decades of Brumos Racing competition. The blue and red stripes running from nose-to-tail are easily spotted from a distance but, upon closer examination, reveal the familiar solid stripes are actually comprised of a closely laid grid of the number 59. 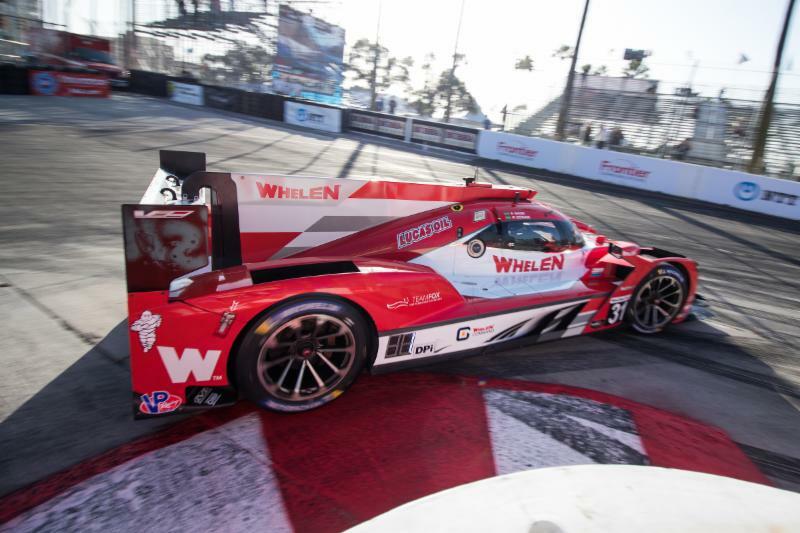 The “sweeps” down the sides from headlight to taillight, draw directly from the team’s historic livery. A white windshield banner and rear wing mark the No. 911 shared by Patrick Pilet (France), Nick Tandy (Great Britain) and Frédéric Makowiecki (France) as does a blue line across the rocker panel on the side. The No. 912 team car of Earl Bamber (New Zealand), Laurens Vanthoor (Belgium) and Mathieu Jaminet (France) will have a black windshield banner, rear wing and red stripe below the doors. No entry number is more closely aligned with sports car racing than “59”. It and the Brumos paintwork became so synonymous with the sport that, despite never racing outside of North America, it remains instantly recognizable worldwide still today. The livery was a natural fit for the two endurance classics – known collectively as the “Florida 36” – to celebrate not only the Jacksonville-based race team but also the 50th Anniversary of the Daytona Beach-headquartered International Motor Sports Association (IMSA). Brumos was a founding stakeholder in IMSA, winning the first five of six races in the inaugural IMSA sports car season of 1971 with team and dealership owner Peter Gregg and a young Hurley Haywood sharing a Porsche 914/6. Since, the Brumos banner has flown over 48 IMSA victories and 15 IMSA Championships. Over the course of its life and through five dedicated owners, Brumos Porsche remained a stalwart in sports car racing, its prime era coinciding with the growth of IMSA. The immediately recognizable color scheme identified Brumos through to its final GT championship in 2011 with Andrew Davis and Leh Keen behind the wheel of a Porsche 911. Brumos won the Rolex 24 four-times (1973, ’75, ’78, 2009) with both Porsche GT and prototype entries. The final Brumos Daytona victory came with a Porsche-powered Daytona Prototype shared by David Donohue, Darren Law, Buddy Rice and Antonio García. The race program closed in 2013. Porsche ran its first historical liveries at the 2018 24 Hours of Le Mans, winning the LMGTE-Pro class with the immensely popular “Pink Pig” livery – drawn from the 1971 Porsche 917/20. It took second-place with the famous “Rothman’s” livery derived from the Porsche prototype and GT cars of the 1980s. In North America, the factory program closed the 2018 IMSA season with a GTLM class victory at the Petit Le Mans under the colorful wrappings of the Mobil 1 Porsche GT1-98 from 1998.